I sure as hell don’t. 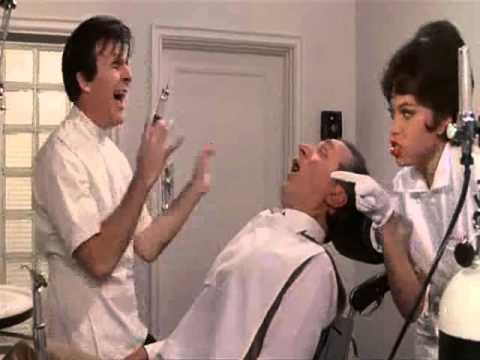 I haven’t been for years and in my bright brain I thought, hmmm well, I’ll take baby steps towards going and I’ll start with the hygienist… that should be a relatively short, brief introductory into getting in that chair. Ok so I may be a big wuss but I came out traumatised! First of all I hate that chair. Second of all, why the hell do they always use appliances that make that high pitched whining noise that echoes around your head? They’re the sort of tools you’ve only seen on those dodgy sci-fi movies where you know something bad is gonna happen – and slowly. HATE that sound. Thirdly, my mouth doesn’t open that wide and who the hell keeps their mouth open that long anyway? All the while pretty much drowning in your own spit because the lil sucker thing is so not doing its job. And to top it off? Lesson learned – don’t use Corsodyl. My gums sometimes bleed so I tried it out BAD IDEA apparently that sh*t stains your teeth and gets into all the tiny crevices so your hygienist has a job getting it all off. Brilliant. It’s going straight in the bin. Anyone feel like nothing is right? Using the wrong toothbrush. Using the wrong toothpaste. Don’t use toothpaste it’s got fluoride. Got the non-fluoride toothpaste now my teeth are worse. Don’t use mouthwash it’s got alcohol in it. Do use mouthwash just without alcohol but it’s got fluoride. No but fluoride is good it prevents cavities. No it doesn’t it causes them. Floss. Don’t floss. Eat. Don’t eat certain things. Don’t smoke. Don’t drink. Everything is bad. AAAAAAAAAAAARRRRGH. And at the end of it all we probably still have to go to the dentist because we’re all getting older, there’s wear and tear and when / if something gets so painful, we’ll be drudging ourselves along to the place we hate most. Seriously though – can they not do something about the look and feel of the room ? Make it more welcoming – putting on those massive shades and lying back with that bright round light in our face does not make us think we’re on a beach relaxing. At least get some tools that don’t make a sound? Play some music? Something?! *sigh* why can’t I just have perfect teeth n gums? Posted on March 27, 2015 March 27, 2015 Categories blog, body, dentist, flouride, Health, teethTags blog, blogging, cavities, corsodyl, floss, flouride, hate, healthbecomesme, hyginest, plaque, polish, scale, teeth, toothbrush, toothpaste, trauma, who likes the dentistLeave a comment on Who likes the dentist?